An integrated JBL/BSS Soundweb audio solution has been deployed by Sound Division Group at London’s most iconic building, The Shard. An integrated JBL/BSS Soundweb audio solution has been deployed by Sound Division Group at London’s most iconic building, The Shard. On the 31st and 33rd floors of the spectacular Shard, the tallest building in Western Europe, David Yeo, founder of Aqua Restaurant Group, has opened two diverse restaurants — aqua shard (31st floor) and Hutong (33rd floor). Situated halfway up the building, they offer panoramic views over the London skyline. Having earlier worked at Aqua London in Regent Street, David Graham’s AV integration company Sound Division was awarded the contract to provide sound reinforcement and control at the new venues — along with a full CCTV package. They have designed elaborate background music systems, with facility for a punchier system at the 31st floor atrium bar, while Soundweb London devices, located in the central comms room on the 31st floor, distribute feeds over an extended matrix, at the same time offering independent zonal control. “The client wanted a high quality music system to provide multi zone sound, with separate source selection,” said Graham. “The client brief was specifically that the speakers needed to blend in with the aesthetics, without obscuring any of the spectacular views over London. It was logical to use the established combination of JBL — a brand selected by the client himself — and BSS Soundweb, as we have many times in the past.” All JBL/BSS products were supplied by Sound Technology, the UK/Eire Harman Professional distributors. Future-proofed via an infrastructure network of CAT 6 wiring, and offering expandable functionality via a number of plug-in points, the company has provided options for laptop, video or other music (such as live sound and highly specified DJ set-ups) to be imported and plugged straight into the digital infrastructure. He said that designing a complex, but intuitive system, all within a carefully zoned layout, was based on previous experience of the client’s requirements at his first venue in Regent Street. The budget had allowed the integrators to design a ‘flagship’ central rack, he said, populated with a BLU-100 12 x 8 main processor, and a BLU BIB input and three BLU-BOB output breakouts to give multiple I/O options. Six BLU-8 remote touch controls are strategically placed (three on each level) for easy source select/volume control operation by non-technical staff. “It’s a great product, as aside from its ease of use, the beauty is that it can control four zones from a single panel,” notes Graham. Playing out through the speakers is sophisticated, low level background music based on customer profiling, programmed and delivered by 8 Track Music Solutions. The interior at aqua shard’s 220-cover British cuisine restaurant (above and top) spans two wings, linked by a three-storey high atrium bar. 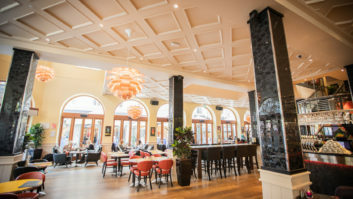 With its low-level plasterboard ceiling, Sound Division has opted for multiples of JBL Control 26CT flush ceiling speakers and JBL Control 19CST sub bass ceiling speakers across the seven main (and private) dining rooms, with JBL Control 26Cs and 19CSs for the main bar. The eight zones are powered by a combination of 100V and low voltage amplifiers. @page_break@Two floors above, David Yeo himself conceptualised every detail of the dramatic 130-cover Hutong, which serves contemporary Northern Chinese cuisine. This time the aesthetic is entirely different with exposed duct work and piping. Here Sound Division has specified over 20 of JBL’s Control 67 Pendant speakers, adding SB210 sub woofers where necessary (in the main bars and dining rooms). “We have used this combination before — they work extremely well and were the perfect choice for this environment,” said Graham.